Healthy food cannot be defined by nutritional quality alone. It is the end result of a food system that conserves and renews natural resources, advances social justice and animal welfare, builds community wealth, and fulfills the food and nutrition needs of all eaters now and into the future. Yet common practices in our modern, industrial food system are creating significant global health and environmental problems. In the United States, the four leading causes of death—and largest sources of healthcare expenditure—are directly linked to food: stroke, diabetes, cancer, and cardiovascular disease. Industrial food production, dependent on significant amounts of synthetic pesticides, fossil-fuel based fertilizers, water, and energy, is contributing to climate change and degrading ecosystems by polluting soil, water, and air. The industrial food system’s reliance on production inputs such as antibiotics and growth hormones to compensate for crowded and unsanitary livestock conditions are compromising drug efficacy and placing human and animal health and welfare at risk. Our Healthy Food in Health Care program harnesses the purchasing power, expertise, and voice of the healthcare sector to advance the development of a sustainable food system. Our advocacy campaigns bring the sector’s clout and perspective to bear on critical food systems issues such as the overuse and misuse of antibiotics in animal agriculture, aligning dietary guidelines with health and sustainability principles, harmful chemicals in our food systems, the climate-food connection, and opportunities for health care to make upstream investments in public health. We partner with over 1,000 hospitals across North America to source and serve foods that are produced, processed, and transported in ways that are protective of public and environmental health. Our advocacy work with thousands of health professionals has resulted in the creation of sustainable food purchasing policies, environmental health curricula, and advocacy for healthy food policy at federal, state and local levels. 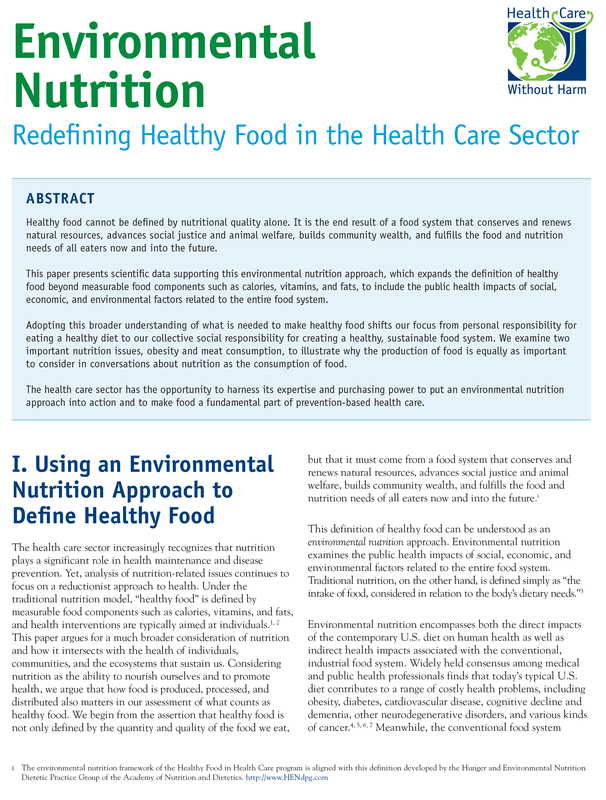 Health care institutions around the country have begun to adopt practices and policies to support a healthy food system — one that is environmentally sustainable, improves nutritional quality, and supports human dignity and justice. 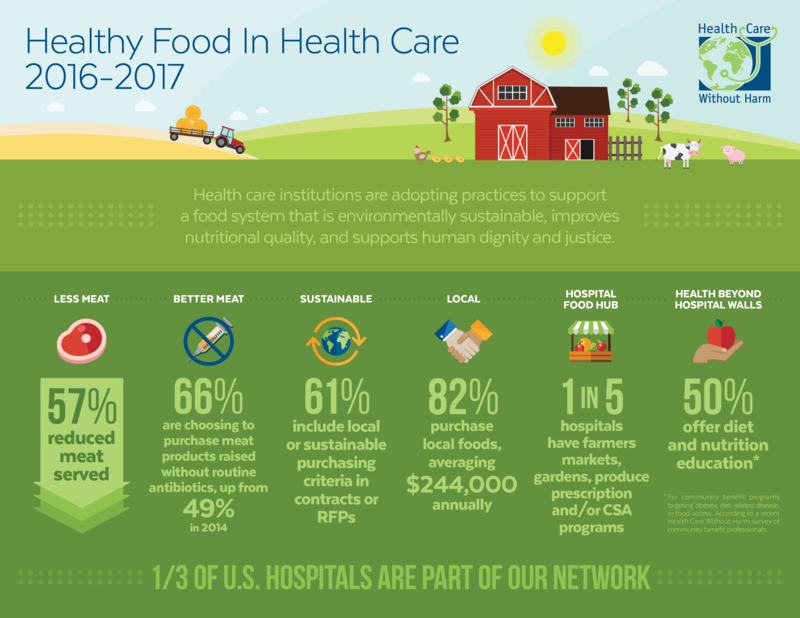 Trends show U.S. hospitals are changing the food system: Menu of Change 2017. The Healthy Food in Health Care program advances its work through four core initiatives. We invite you to explore their respective web pages and consider how your facility could best engage with our efforts. The Healthy Food in Health Care Pledge is a framework that outlines steps to be taken by the health care industry to improve the health of patients, communities, and the environment.